I transformed my classroom into a workshop, a place where apprentices hone a craft under the tutelage of a master. 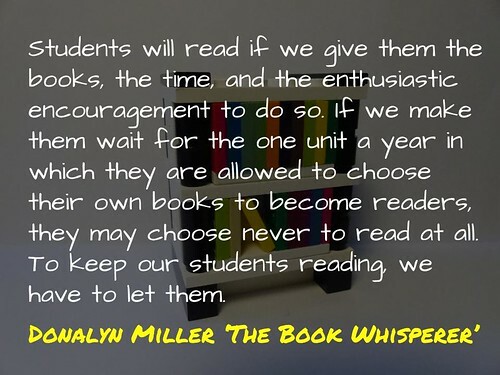 I learned that being the best reader and writer in the room is not about power and control. Instead, I must be a source of knowledge that my students access while learning how to read and write. Instead of standing on stage each day, dispensing knowledge to my young charges, I should guide them as they approach their own understandings. Meaning from a text should not flow from my perceptions or, God forbid, the teaching guide; it should flow from my students’ own understandings, under my guidance. This change in mindset meant scrapping non-reading warm-ups and fun folders to instead set students the lofty goal of reading forty books across the year, with the belief that students rise to the expectations made of them. This goal also came with the requirement to read a range of genres. Throughout Miller’s book, she critically evaluates many of the elements commonly found in the classroom, including the whole class novel, comprehension tests, book reports, reading logs, popcorn reading and incentive programs. Some of the alternatives she provides are to teach readers rather than books, provide access to audio books, write online reviews, create book commercials, provide regular time in class and prepare for reading out loud beforehand. One question I had about the book was the focus on the physical book. Miller talks about the importance of creativity, empathy and citizenship, yet I was left wondering why digital literacies do not have the same privilege. For example, I had a new member of staff in my office last year. A self proclaimed ‘non-reader’, he wears the title like a badge of honour. Yet there is something odd. I spent weeks thinking through how I could support him to discover the inner reader. Yet as the year unfolded, I discovered a certain fallacy to the idea of a ‘non-reader’. Although he may not have ‘read the book’, he could tell you every character and consequence from Breaking Bad. In addition to this, he was able to find an episode of The Simpsons to support every situation. Is this a problem with reading or do we just need to better recognise transliteracy, rather than be restricted solely to print media? In the end, I do not believe every one of Miller’s strategies is necessarily scalable, including the expectation that teachers provide their own extensive library. However, she does demonstrate that with perseverance and refinement it is possible to develop new and innovative solutions. REVIEW: The Book Whisperer by Aaron Davis is licensed under a Creative Commons Attribution-ShareAlike 4.0 International License. Very interesting, Aaron. You’ve started me thinking about the way we privilege different literacies. Is being tv literate as desirable as book literate? I do think the written word brings a greater ability to reflect, review, think critically than TV. I am not sure Corinne, but I think that my question is who is it desirable for? Is this study of TV http://www.abc.net.au/radionational/programs/futuretense/what-law-and-order-can-teach-us-about-technology/5403468 not as important as reading a book? I think that it comes back to digital literacies http://readwriterespond.com/?p=476.